Perhaps the biggest advantage of being a stay-at-home mom is that you get the see your children grow up. I am experiencing it now. My little girl is growing up fast. At 3 months, she is now 6+ kg. They say that breastfed babies are less heavier than their formula-fed counterparts, but this one is quite the contrary. She is heavier than her brother when they were both at the same age. Just for comparison, here are photos of them in the same outfit. 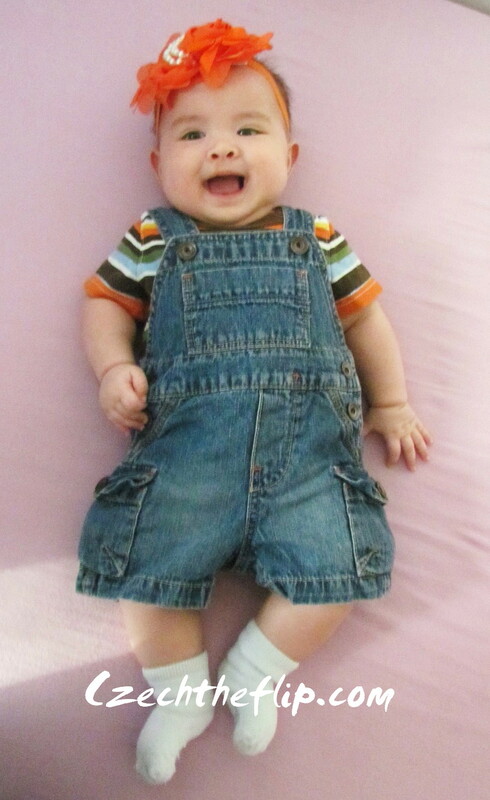 This was Jakub at 3 months. And now this is Michaela. Being a second child, she gets to inherit her brother’s hand-me-downs. I hate throwing away such good stuff, so I am making her wear Jakub’s old outfits. Although, I bought a couple of headbands to give it a little feminine touch. Even though she is heavier, she is still within the ideal range, so I’m not so worried about setting her up for obesity. I’m pretty sure that when she is able to run, she will be as active as her brother and will easily lose all those baby fats. Jakub was pretty chubby when he was a baby too. But now he is very lean because he’s getting taller. I actually wanted him to gain a little bit more weight, but can’t really complain because he is very healthy. Here’s both of them now. Anyhow, I am happy to have this chance to stay home with them. I will never trade it for anything else in the world. I’ve been hopng for a picture and news! Both your kids are beautiful, and the photos make me smile. Don’t worry a bit–Michaela looks just right. Congratulations! P.S. My daughter Bea wore all her brother’s hand-me-downs too. I wonder if your parents have gone to visit your family. You never have to worry that a breast-fed baby is too fat. Truly. And I’m jealous that you are able to enjoy the time with your two babes – and blog about it!